You can expect an epic spew of creativity when Victor & Rolf, Jean Paul Gaultier and Comme des Garçons show their collections on the same day in Paris. 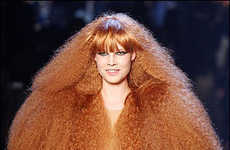 In the case of the Comme des Garçons Spring 2010 Collection, the model hairstyles stole the show as the main fashion accessory. 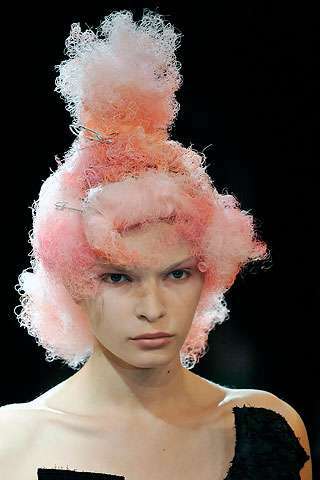 The wigs, which looked like cotton-candy pinned into poodle-esque hairdos, were baby pink, green and yellow. 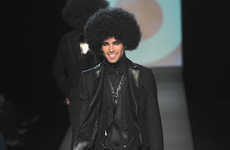 It’s hard to decide if the hairstyles detracted or benefited the Comme des Garcons Spring 2010 line, which had heavy circus appeal. Besides classic black and white polka dots, there were cherry red suede shoes, and patchwork florals. Designer Rei Kawakubo is known for her highly creative concepts, and may have explained this collection best backstage when she admitted, "I’m an adult delinquent, to the end."